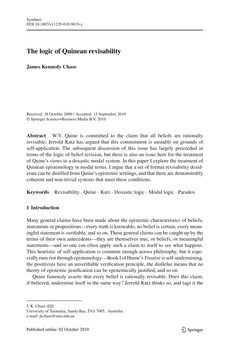 W. V. Quine is committed to the claim that all beliefs are rationally revisable; Jerrold Katz has argued that this commitment is unstable on grounds of self-application. The subsequent discussion of this issue has largely proceeded in terms of the logic of belief revision, but there is also an issue here for the treatment of Quine's views in a doxastic modal system. In this paper I explore the treatment of Quinean epistemology in modal terms. I argue that a set of formal revisability desiderata can be distilled from Quine's epistemic writings, and that there are demonstrably coherent and non-trivial systems that meet these conditions. © 2010 Springer Science+Business Media B.V.